Søllerød Kro is an institution in Copenhagen. The old inn has been around since 1677 – that’s 340 years! Since the transformation to a restaurant in 1964, it has always been considered as one of the finest in Denmark. Many a head chef has passed through the doors. Michel Michaud, Francis Cardeneau, Paul Cunningham, and Jakob de Neergaard to name a few. 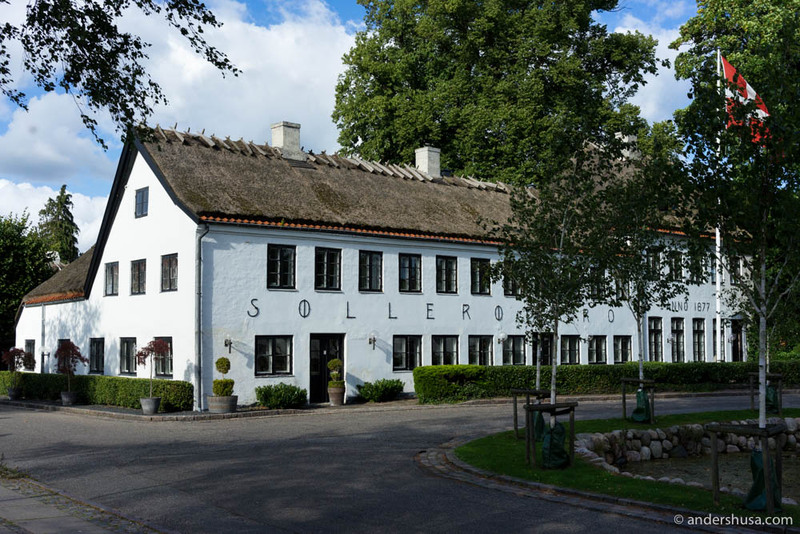 Unlike many other classical restaurants, Søllerød has managed to evolve as time has passed. Even though it’s still very conservative in its appearance, especially the interior, the food is definitely up to date in 2017. That’s thanks to the current head chef, Brian Mark Hansen, who’s brilliant palate, solid technical skills, and eye for aesthetics has defined the excellent cooking at Søllerød Kro since 2013. 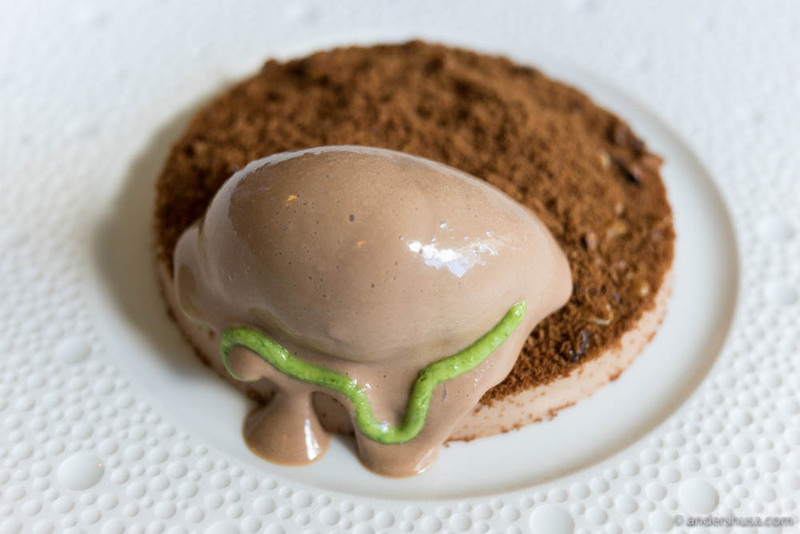 While Mark Hansen is still honoring the French cuisine, he also manages to unite it with modern cooking techniques and exciting new flavors. 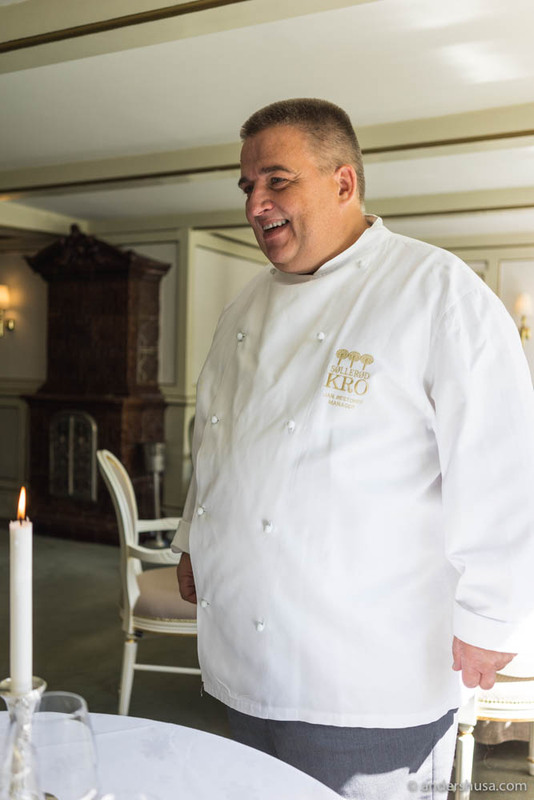 Since 1999, Søllerød Kro has also had one of the most passionate and beloved restaurant managers. The host, as he prefers to call himself, is a leading star in Scandinavia (and perhaps among the world elite). I am talking, of course, about Jan Restorff. The man, the myth, the legend, who just happens to be celebrating his 50th birthday today. Congratulations! After visiting some pretty cool places and spending time in the region of North Zealand for a couple of days, we set the GPS in our car towards Søllerød Kro. My first visit to this magical place was back in December 2015, when I attended a lunch here as part of a press trip. Back then, we only had a shorter, albeit wonderful, teaser menu. Finally, I’m here again, and about to get the full Søllerød experience. The world-class cooking of Brian Mark Hansen and the heart-warming hospitality of Jan Restorff awaits us. We park the car in the parking space on the backside of the restaurant. Excited and eager, we enter the gates of the tavern. Jan Restorff already expect us in the door, standing there with his big enthusiastic smile, wide open arms, and welcoming attitude. – I hope you are hungry? he laughs, as only Jan can chuckle. You bet! We have even skipped breakfast to make room for this lunch (and as it turns out, we’re gonna need it). In case you think a lunch at Søllerød Kro is any different from a full dinner, you are, in fact, mistaken. These guys don’t mess around. It’s always full throttle here, regardless of the time of day. Champagne from David Léclapart fills our glasses. A series of snacks arrive at the table before we can say: Cheers! A faux eggshell filled with egg foam, cucumbers, crunch, and fish roe is delicate and rewarding. Textures and flavors in great harmony. The small tartelettes with truffle and parmesan shavings are as good as they sound. Cured duck wrapped around a prune marinated in soy sauce has that delicious combination of intense salt and sweetness. Rolls made of apple, infused in yuzu, is a stark contrast – super refreshing and acidic. Ending the snacks is a green gazpacho soup served with a cress ice cream. It looks pretty and the taste is subtle and mild, but it’s not my favorite. A waiter comes out with a bread basket and explains the selection. – The light one is made with yogurt and Danish pilsner, sprinkled with biodynamic oats. Additionally, there’s a round malt bread with walnuts. The first butter is from Northern Jutland, a dairy house called Aabybro, and is made with sea salt. The other is whipped buttermilk. 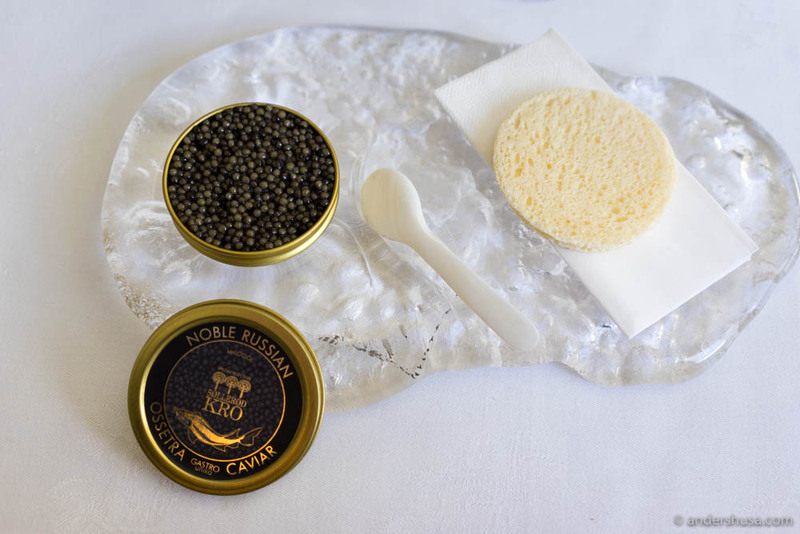 – On the top, the caviar we use at the moment is from Belgium, from farmed Oscietra sturgeons. Oscietra Unika is made without any additives. – You know, it started as a joke. Bo Bech, back in the days when he had restaurant Paustian, invited his entire staff to dine here. 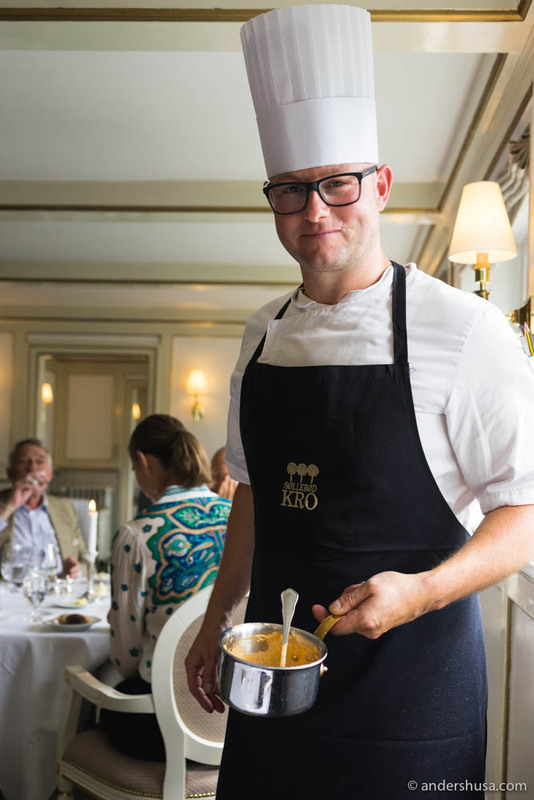 Jakob de Neergaard, who was the head chef back then, made a cream with caviar just on the top. The idea was to trick the chefs into thinking they were getting spoiled with caviar. Afterwards, I thought: we can sell this! 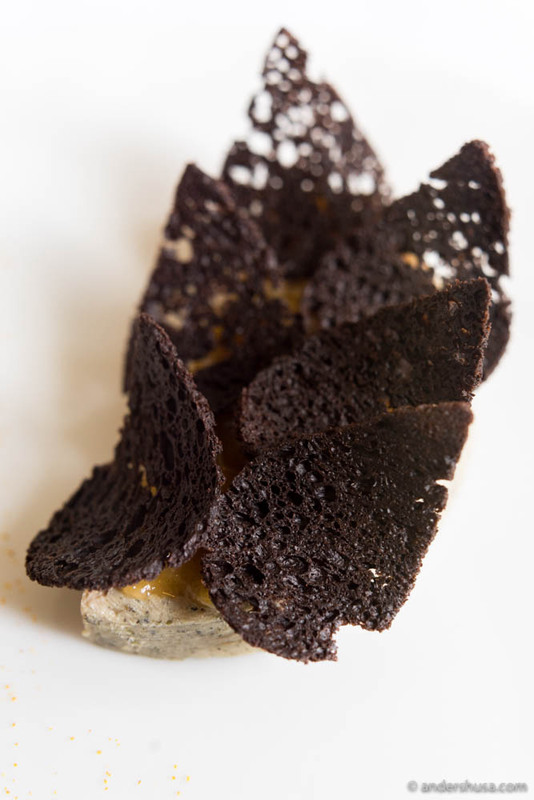 The first version made for regular guests at Søllerød Kro had a cream of Jerusalem artichoke, topped with langoustine, and caviar. It’s that great combination of something soft and creamy underneath, gentle sweet flavors and more distinct texture in the middle, and the salty, popping fish eggs on top that just works. Since then it has been a classic that we change from season to season. Jan brings out a bottle of one of my all-time favorite wines: a 2011 Chardonnay by Emmanuel Houillon produced at Maison Pierre Overnoy in the small town of Arbois Pupillin, part of the Jura wine region. How does he do it? Could he have read up on my preferences, or is this a coincidence? I ponder about that for a split second before our next course arrives. 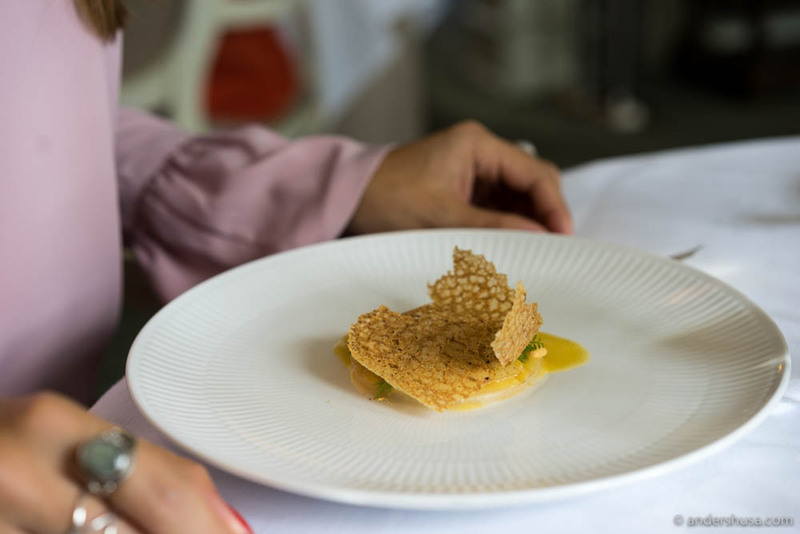 Scallops, finely sliced and spread out on the plate, soaked in a sauce of butter and yuzu, with fermented green asparagus, Piedmont hazelnuts, and yellow marigold flowers, are topped with some remarkably thin chips of pork cracklings. Again, a wonderful harmony in textures as well as flavors. Sweet, acidic, nutty, and salty, Fatty and refreshing. Soft and crispy. We wash it down with generous amounts of the juicy, fermented grape juice that now swirls around in our glasses. Lemon sole is the third serving, with one of Brian Mark Hansen’s signature skins on top. This one is made from Nicoise olives. It’s wafer-thin. Underneath are grilled tomatoes, a purée of artichoke and poured over is a delicious sauce made with olive oil and flavored with burnt lemon juice, salvia, and honey. It works so well together, but we’re already starting to get full. Oh no! That’s when Jan Restorff comes to the rescue. As if he senses that we need a break, he invites us for a tour in the cellar. We return upstairs with a bottle that we’ve selected with the steady guidance from Mr. Restorff. A 2013 Le Cloud pinot noir from Domaine Prieuré Roch in Ladoix, Côte de Beaune, France. The personal venture of Frederic Roch, co-director of the prestigious Domaine de la Romanee Conti. – You think we’re having meat next? Hedda asks me, hoping that we are getting near the end of the savory part. Nope! One more seafood dish arrives, presented by Brian Mark Hansen himself. 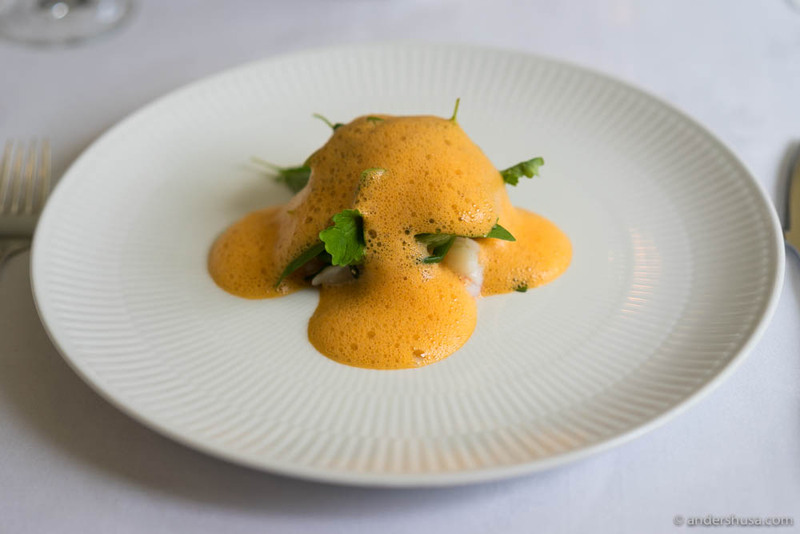 – Danish lobster, which has just gently kissed the pan, with grilled Thai basil and a red lobster curry foam with coral butter and ginger. What a sudden change in flavors! I would not have guessed that such profound Thai flavors would be part of a classical French and Danish menu, but it is a refreshing turn of events. – I bet we’re having foie gras next, Hedda guesses. Minutes later, to my surprise, she turns out to be correct, and my favorite serving of the entire meal arrives. I actually forget all about being stuffed. – We call it the best from the duck! says Mark Hansen. Foie gras au torchon, poached in duck fat, is served with a kumquat purée flavored with apples and pears, thin crisps of brioche infused with cocoa, and, lastly, a dust of orange peel and green pepper on the plate. That way you can adjust the flavors yourself. This one is easily short-listed for best dish of 2017! The best from the duck! – Foie gras au torchon – foie gras in a towel. In the proper old days, before they had power, fridges, and freezers, they made foie gras this way. They cleaned it, wrapped it in a towel like a sausage, and poached it in duck fat until the desired core temperature. Lastly, it was preserved in more duck fat and stored in the coolest part of the cellar until more festive days when it was devoured. Where do you get this amazing quality of foie gras from? I ask Jan.
– We get our foie gras from Hungary and its delivered no later than two days after slaughtering. The geese live a good life, with plenty of space to roam about, and it’s only the final two to three weeks before they are slaughtered that they are fed more heavily to make the liver grow. This is actually a natural part of life for geese, to fatten up before the annual trek south for the winter. In fact, that’s how foie gras was discovered. At this point, we are more than ready for desserts, but Søllerød Kro manages to serve us yet another seafood dish! 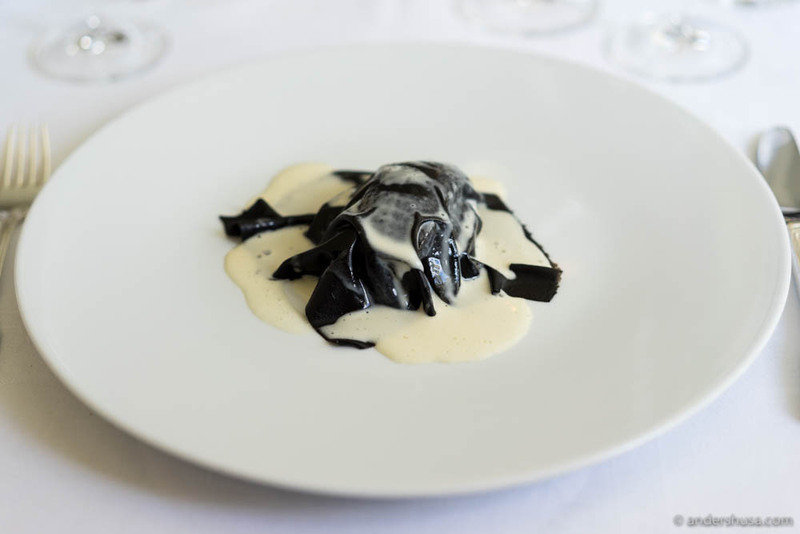 Turbot with a ragù of fava beans and Bourgogne snails, with edamame beans, parsley purée, topped with another one of the signature skins of Brian – this one made from fermented black garlic. The final element: red wine glaze cooked with the broth of the turbot’s head. Honestly, while there is nothing wrong with the dish, it feels repetitive and unnecessary. Thus, it ends up as the only dish I do not finish. 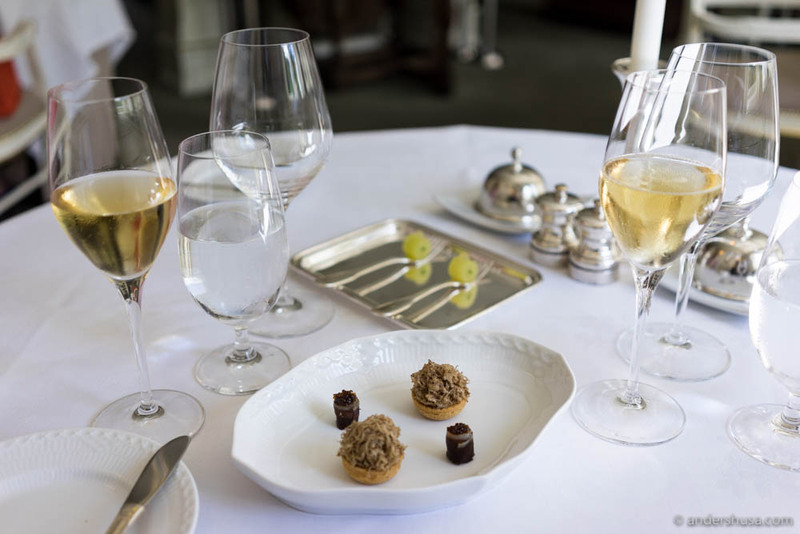 However, I would never have skipped the final savory serving of Canette en croûte – salted duckling and smoked duck hearts that are baked inside a crispy pastry. On the side, is a tower of morel mushrooms that surrounds forcemeat of sweetbreads, a morel sauce, and a cream of walnuts & Port wine. Woha! 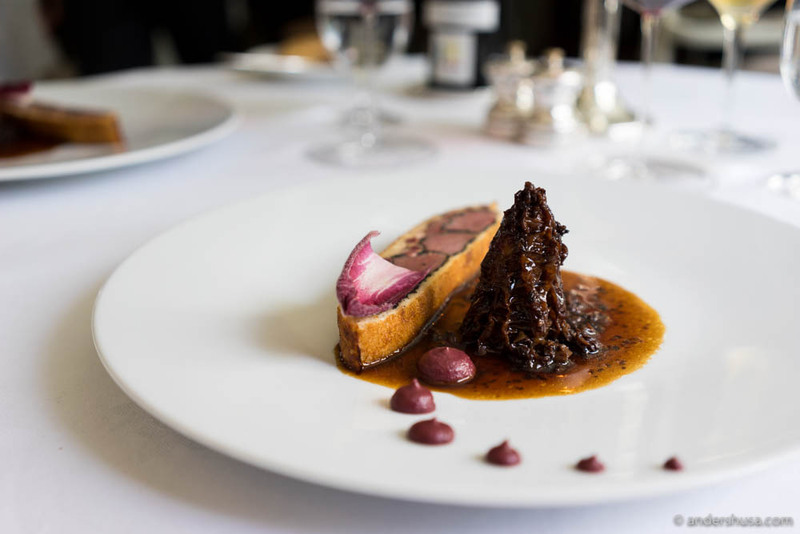 This dish instantly brings back memories of one of the servings by Ulrik Jepsen at restaurant À L’aise in Oslo – and it’s not a bad recollection. At last, we have rounded the salty part of the meal! Pre-dessert: a lemonade with green tea, elderflower & ginger, together with a lemon macaron with thyme. 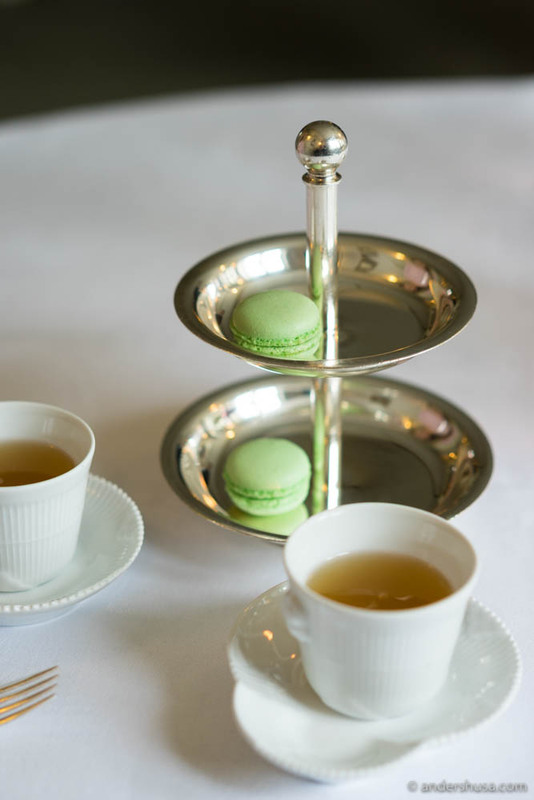 A pre-dessert of lemonade with green tea, elderflower & ginger, together with a lemon macaron with thyme, help ease the transition into the sweet world of Søllerød Kro. We need that, as we have no idea what is about to hit us. 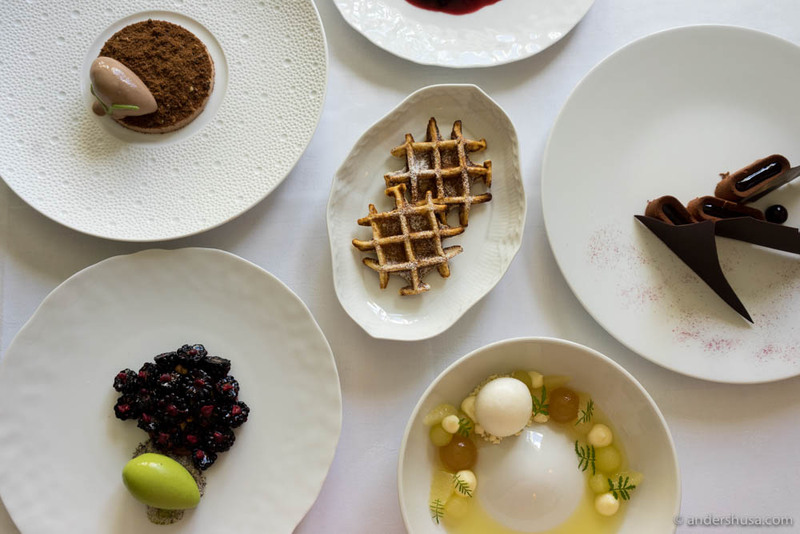 Chef Brian Mark Hansen and a team of waiters start filling our now-empty table with plate after plate of colorful and luscious-looking desserts. I can hardly keep count, but there’s a Belgian waffle that is supposed to be enjoyed on the side of a rødgrød med fløde – a classic Danish dessert of red berry porridge, presented tavern-style with a red currant sauce and a vanilla ice cream. Another plate holds Søllerød’s version of an iconic Danish popsicle called Kæmpe Eskimo. It’s a vanilla parfait surrounded by 70% Cru Udzungwa Tanzania chocolate with blackcurrant sauce. There’s one refreshing bowl with buttermilk ice cream and elderflower, and a heavier (yet very fluffy) chocolate mousse and sorbet. – Are you trying to kill us with sugar? I ask Brian Mark Hansen. He just laughs as he walks off. Jan comes over to entertain us again and shares some details about the desserts. We all agree that the rødgrød med fløde is the most amazing, and the runner-up is the cherry parfait, with smoked, caramelized almonds, blackberries, freeze-dried raspberries & woodruff sorbet. God, I love woodruff. I forgive Brian for his attempted murder. The first Michelin star was awarded to Søllerød Kro in 1987, lost some years later, but renewed in 1997, lost again, and, finally, recaptured in 2007. Notice the 10-years cycles? 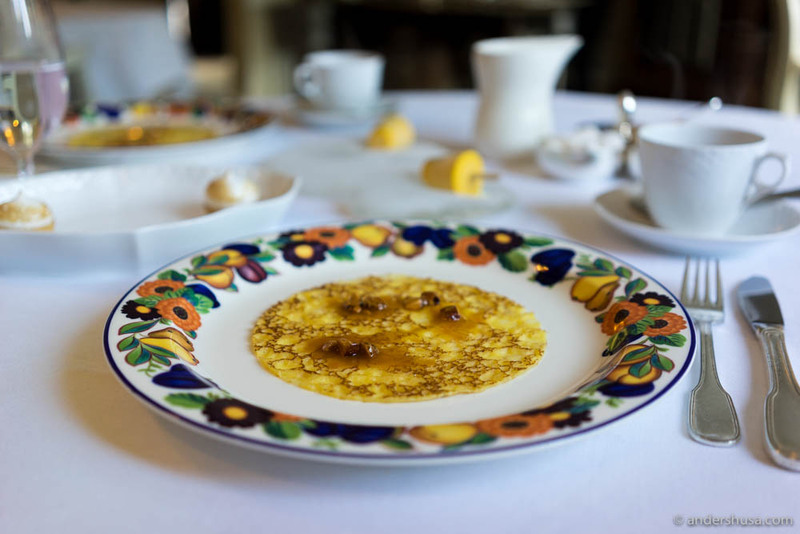 Critics and foodies have been yelling for years now that this restaurant deserves more than the single star it has, and I couldn’t agree more. Søllerød Kro is a solid two-Michelin-starred restaurant, without a doubt at the same level as Fäviken, AOC, and Vollmers in Scandinavia. It is far above the level of many one-starred restaurants, but I’ll refrain from naming and shaming, and if anything, it’s closer to three stars than one. Could 2018 be the year where the spell is broken and the French Bible realizes its horrendous error? Let’s hope so. Have you experienced the magic of the old inn? Please share your best Søllerød Kro story below. Hi Romain. Hope you get to experience both Søllerød Kro outside Copenhagen, and Vollmers in Malmö someday – they really are special. We didn’t have a wine pairing at Søllerød, we just went by Jan’s recommendations by the bottle. Thanks for the nice words, and I’ll make sure to get in touch with you before my next (wtf) France trip! It is such a pleasure to read that you’ve enjoyed your visit at Søllerød Kro. It is probably my favorite restaurant in the entire kingdom and that says a lot. It is easily a two-starred restaurant. Beautiful pictures as always!